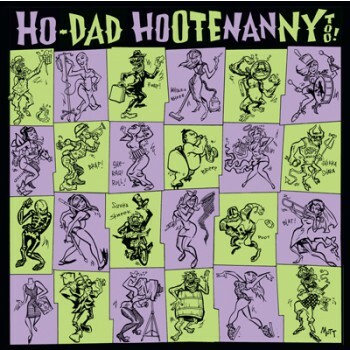 This goes out to my beloved brother-from-another-mother and brilliant songwriter and all- round genius, howler supreme for the Raunch Hands (appropri- ately dubbed the Crypt Records house band by John Schooley). I will always love you. 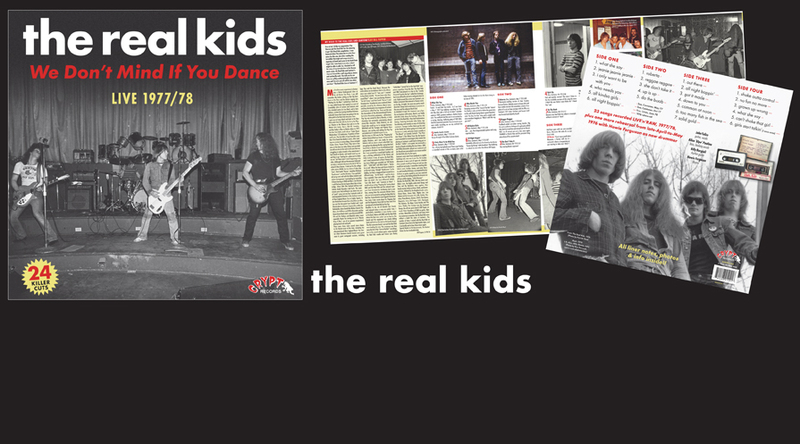 8 unissued proto-punk rippers from pre-Real Kids combo THE KIDS ('74) & 4 unissued REAL KIDS demos ('77)! 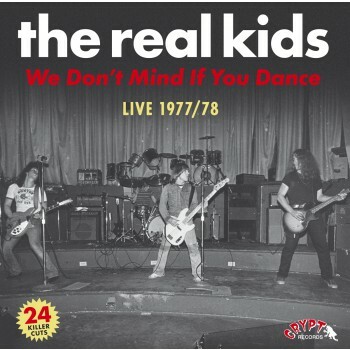 24 previously unissued REAL KIDS cuts - 23 live cuts from 1977-1978 chosen as best from a stack of 44 cuts, plus 1 rehearsal from 1976. 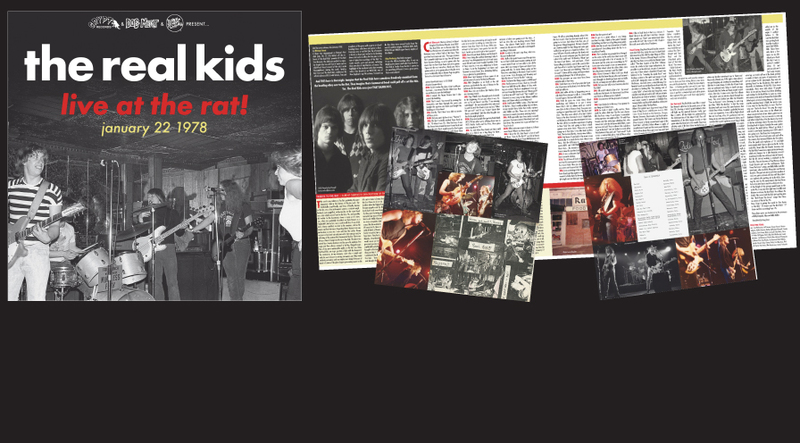 19 originals and 5 cover songs housed in double gatefold LP plus inner sleeve crammed with photos and liner notes. Digipac CD with 24-page booklet. 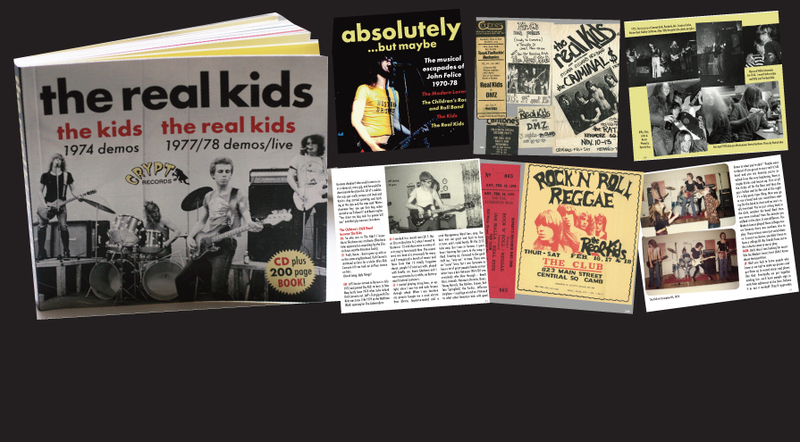 24 previously unissued REAL KIDS cuts: 10 crude rehearsals from 1976 plus 14 live cuts from 1976-1977 - all housed in double gatefold LP plus inner sleeve crammed with photos, zine clippings and liner notes. Digipac CD with 20-page booklet. 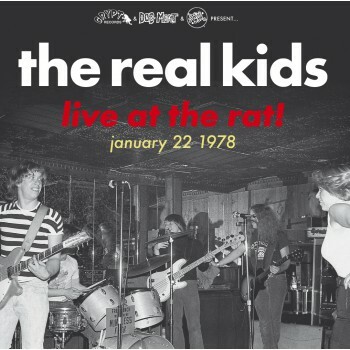 Smokin' live set at the Rat in January 1978 that kicked off the release of The Real Kids’ premier LP for Red Star! 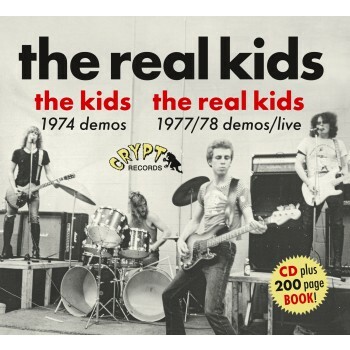 REAL KIDS "The Kids 1974 Demos / The Real Kids 1977/78 Demos / Live" CD plus book! 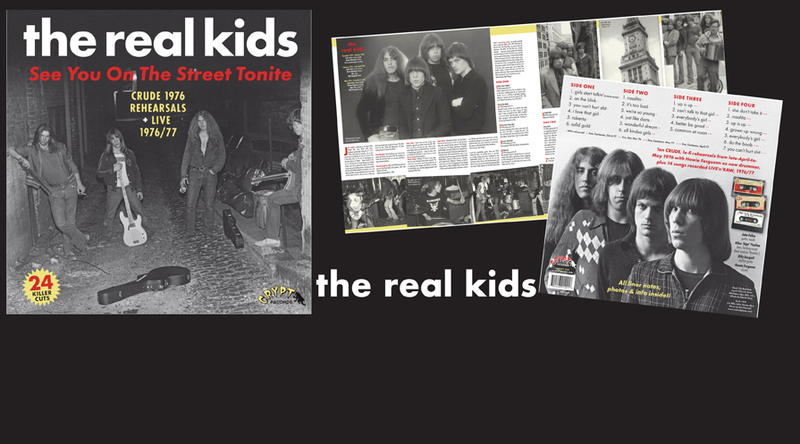 Both KIDS / REAL KIDS LP'S on one CD plus 204-page book with extensve story & unseen photos. 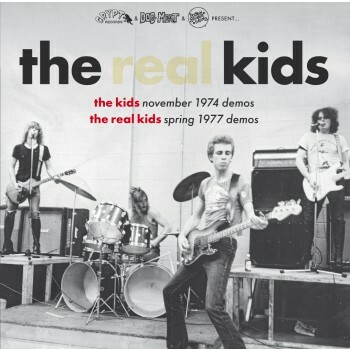 10 LP / 6 CD series of primal teen 60s punk! 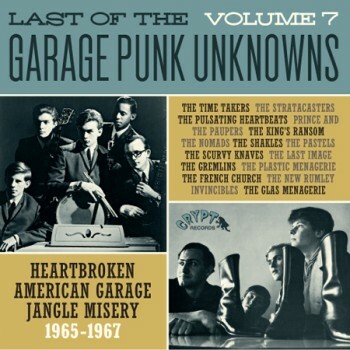 8 LP's / 4 CD's of mid-60s USA garage punk aceness! 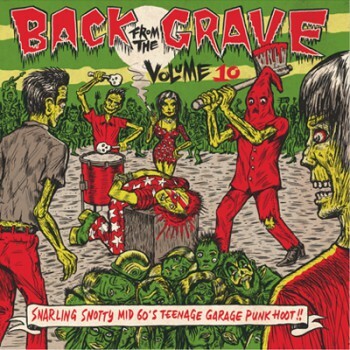 WELCOME TO THE CRYPT RECORDS MAILORDER! Oh yasss! 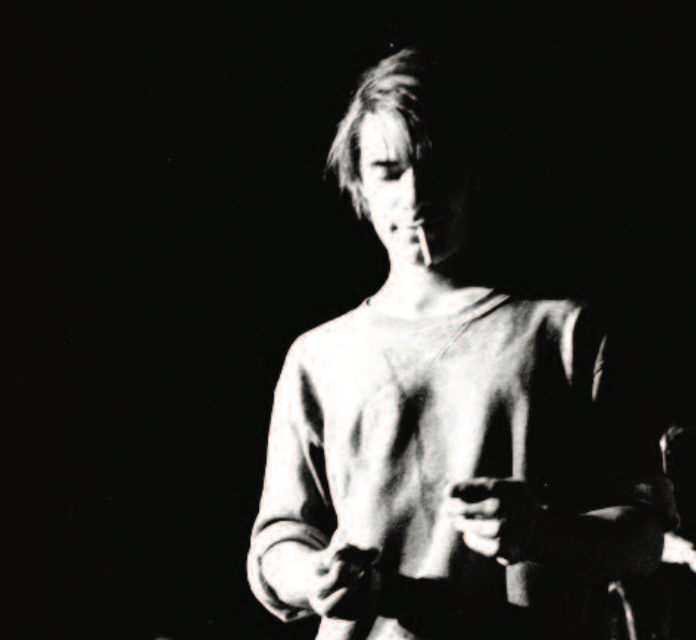 More unissued stuff, way more pix and stories of Boston finest Rock & Roll band. Essential? 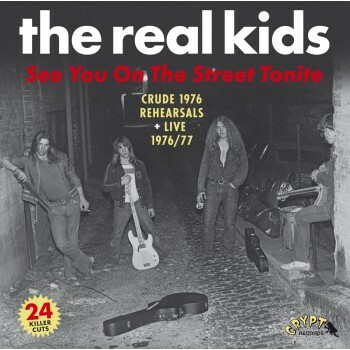 MONSTROUS, GATEFOLDED, THICK COLOR INNER JACKET - all crammed with liner notes, band photos, label scans. 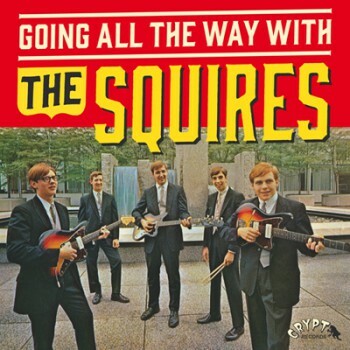 SQUIRES “GOING ALL THE WAY WITH THE SQUIRES" LP + BONUS 7"
Double LP of MID-60s FRAT-ROCKIN’ GARAGE BLOWOUT! 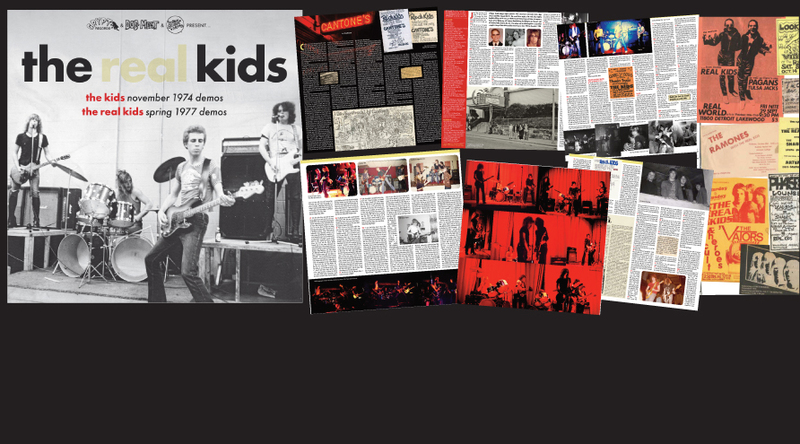 GATEFOLD SLEEVED with liner notes, band photos, label scans.